Meek Mill stopped by the infamous Breakfast Club earlier this week. In the 44-minute interview DJ Envy, Angela Yee and Charlamagne Tha God grilled the Philly hailing rapper on why he still lives in Philadelphia and hasn't moved out of the city - which he all explained. Meek Mill spoke on his new album ‘Dreams Worth More Than Money’ due for release this Summer, who is working with on his new album and who he wants to work with including Jay Z. The interview got a little more deep as he got questioned on how the death of his artist Lil Snupe who died Summer of 2013, affected him and what his relationship was like with the rising rapper. Meek Mill also spoke about beefing with rappers from Philly and calls Cassidy's freestyle on The Breakfast Club "wack". LOL! 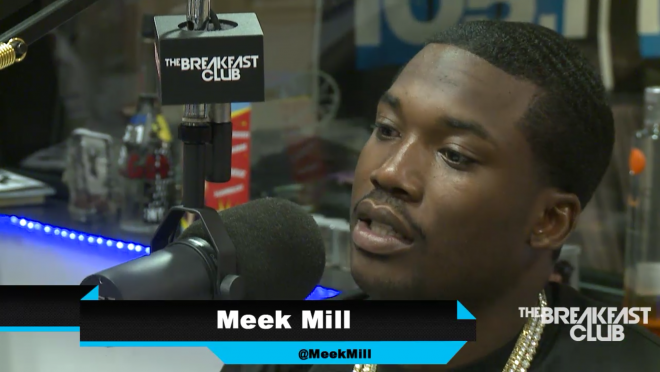 Watch as Meek Mill sheds light on some of the most interesting topics surrounding him.